My 13 year old daughter is obsessed with sewing lately. She has been begging me for quite some time to go to the craft store and buy enough stuffing to stuff enough handmade alphabet pillows to spell her name in pillows. We had an inexpensive solution for the fabric–I pick it up at yard sales when I see it as I know either she or I will use it up in one of our crafting projects. She also needed craft stuffing and that is when the project was beginning to look like it might get expensive. Craft stuffing isn’t horribly expensive, but it isn’t dirt cheap either and she needed enough to fill 8 pillows, one for each letter of her name. I was racking my brain for the best way to save money on craft stuffing–oddly enough I found it in the grocery store. What you are looking at is 23 bags of Halloween spider webbing–I paid just $0.12 cents a bag. 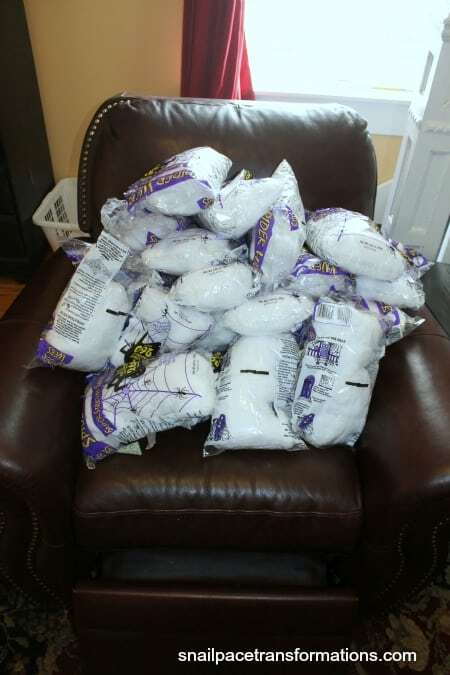 Meaning that entire pile cost me $2.76, which is less than what one bag costs full price before Halloween when they had it for $3.99 a bag and certainly way less than it would cost to purchase craft stuffing. I should let you know at this point that I first bought just 2 bags of it for her to use in another pillow project she tried when it was marked down to $0.25 cents a bag a week earlier and we found it worked just as well as regular craft stuffing. I seriously doubt my daughter will be using all of these bags for her 8 letter pillows, but considering she is on a sewing kick right now and I love to support her creative endeavors, I figured I would pick up all they had and let her go to town. She is already planning out what she is going to make after she finishes her letter project. This isn’t the only instance where my out of the box thinking has saved my family some money. In fact, when my out of the box thinking is combined with my husband’s we have saved CRAZY amounts of money–like paying $10,000 for a 2000 square feet home and renovating every room back to like-new conditions for way less than most people would think possible. Even if you don’t have a daughter who loves to sew and needs inexpensive supplies to keep her habit going and renovating doesn’t interest you–this article can still save you money. 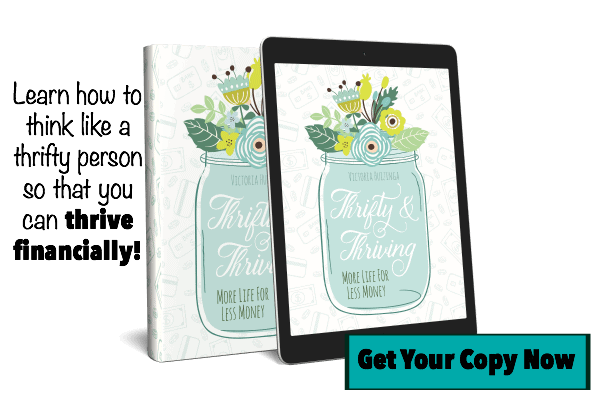 Here is how to apply this money saving principle to your own life. Whenever you have something to buy don’t just go out and buy it. Take a while to brainstorm other materials that would work just as well but cost less. If you are stumped, try visiting my favorite place for creative inspiration: Pinterest. Enter your problem into the search engine and see what pops up. If at first nothing comes up, change the wording of your search to be a little less specific but still particular enough to apply to your problem. Another way my husband and I have saved a tonne of money is by taking a few extra minutes to walk the entire aisle of the hardware store when we need to fix a problem in our home instead of just going straight to the item we know will fix it. By doing this we have found alternative fixes that have saved us a significant amount of money. My kitchen countertops are the perfect example of this. I really wanted granite countertops, but they were way out of my price range. As my husband and I were wandering the aisles for a cheaper hard surface alternative we found granite tile in the exact color I wanted my countertops in and they were 50% off. I love how the project turned out and it was a fraction of the cost of a slab granite countertop. Sometimes my best out of the box thinking comes when I am able to disengage my brain and just let it wander. For me this happens most often when I am out walking or running but for others it might be while you wash the dishes or while you are taking a shower. To take full advantage of my disengaging brainstorm activities I will often write my, “Oh my, that is brilliant!” thoughts down in the notes section of my iPhone and then take a picture of it (because somehow my brilliant self often deletes notes by accident s0 my photos have proved to be a great back-up filling system). How has out of the box thinking saved you money? I would love to hear about it in the comments below. Follow Victoria @Snail Pace Transformations’s board Saving Money Tips on Pinterest. That is a great idea for stuffing and a huge score !! You are such a great and sweet mommy 🙂 Love your tips !! 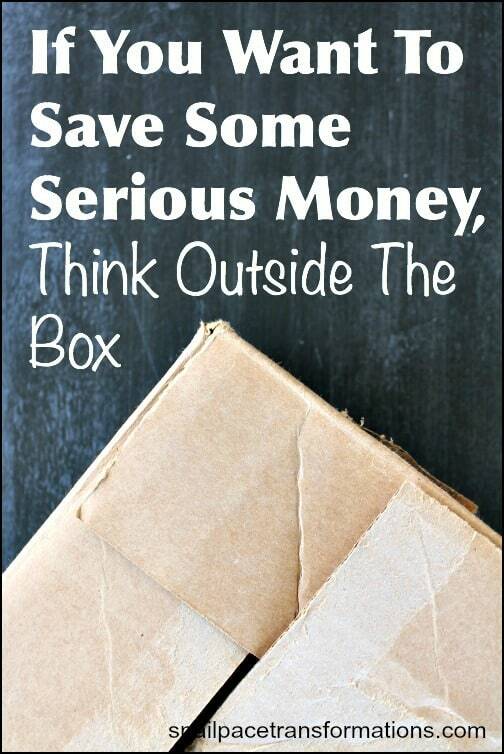 You’re right, thinking outside the box really can save a ton of money! This past week I needed an Isaac Newton wig for my son and wound up making one from TP rolls I had (was saving them to make fire starters, luckily!). Yay for Pinterest, right?? Yes pinterest it a thrifty lifesaver! I needed a short robe for the summer. If you didn’t know, this item is hard to find on sale. I ended up buying s swim cover-up at a discount department store for much less, and it has served me well for many years. That is a great example of saving money by thinking outside the box! Great ideas! I love being able to support the kids’ hobbies in a frugal and creative way. A great lesson for her, too, in resourcefulness.